I love car collectables. I have diecast race cars all over my office, and I once found this $50 clock shaped like a steering wheel on clearance for $11. I brag about it to this day. 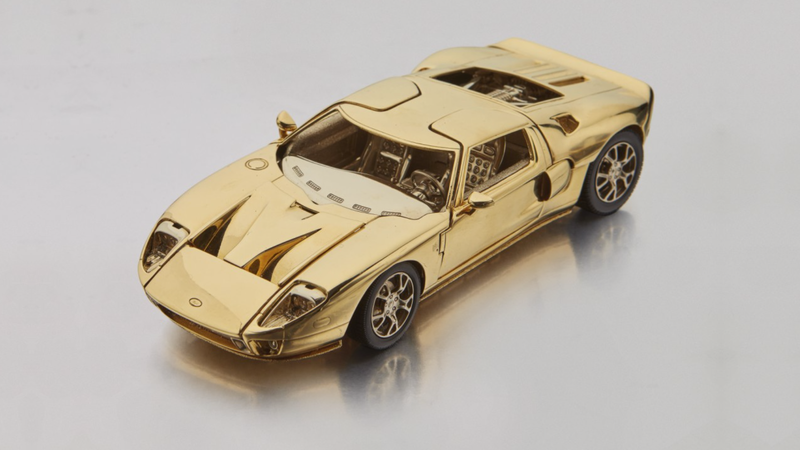 But some collectables are totally perplexing to me, like this solid-gold miniature 2006 Ford GT model. I mean, could you really, truly, ever let someone into your house if you had a $40,000 miniature gold car on your office desk, ready to be plucked off and sold online before you notice it’s gone? Is this a concept I simply don’t understand because I don’t have a $40,000 gold model car in my house? Let’s break this down. This previous-generation Ford GT model car is on Sotheby’s auction site for a starting bid of $25,000, with its 18 karats of two-tone gold, $40,000 estimated sale price, 3.3 pounds of weight, functional rubber tires and all. The jewelers who made it should have gone all out and made the tires gold, too, but I guess it’s cooler to use rubber ones to push your college education’s worth of a model car around like a Hot Wheels toy while showing it off. But $40,000 is a lot of cash for not a lot of toy car, prompting you to ponder some logical questions. This isn’t some $40,000 Datsun restoration in the garage, or a Ferrari engine you bought online and definitely plan to swap into a car someday—you know, larger expensive items that are hard to move without keys or outside assistance. Nope, this is is a $40,000, seven-inch-long hunk of 18-karat gold someone could plop into a tote bag while you’re looking the other way on the house tour. “I’ll tell them it’s fake,” you think, before realizing that would make you sound cheap. You couldn’t allow that, even in these dire circumstances. “I’ll lock it in a case,” you conclude next, immediately taking that idea back as you remember what a great accent it is to the executive desk you bought years ago but rarely use because you have that lovely office in the city. Questions flood your mind, doubt floods your heart and soul, and no one floods the halls of your mansion, because every time you reach for the phone to ask someone to visit, you think about the possibilities your new toy has brought. You’re alone, but at least you have your car of gold.